Ethnocentrism is a major factor in the divisions among members of different ethnicities, races, and religious groups. It's the belief that one's ethnic group is superior to another. Ethnocentric individuals believe they're better than other individuals for reasons based solely on their heritage. Clearly, this practice relates to problems of both racism and prejudice. This comes in stark contrast to xenocentrism - the belief that someone else's culture is superior to their own. For example, you might meet an American who insists French culture is better than the American way of living. In truth, both ideals are a bit skewed. However, you'll see in these examples of ethnocentrism that the practice is not only absurd, but potentially fatal. While many people may recognize ethnocentricity as problematic, they may not realize it occurs everywhere, both at local and political levels. Sure, it's easy to point the finger at the likes of colonial men and women who oppressed slaves, but ethnocentrism still exists today. Let's take a look. To solidify the definition of ethnocentrism, it's helpful to look at present day politics. With instances occurring since its conception, the United States has often thought of itself as more powerful, more economically sound, and generally better than other nations. This has been shown by the country's tendency to dabble in situations occurring in other nations. Some would argue that's what's going on with the country's involvement in the Middle East. Although the idea of every citizen in the United States belonging to one ethnicity is certainly debatable, since the country has citizens who originally came from all over the world, the feeling of national pride stands in for a pure ethnicity in this case. Imperialism, the practice of taking over other lands, was heavily practiced by Europe as far back as the 16th century. Even the colonies in the United States were once controlled by the British. They also overtook lands in Africa, Australia, Canada, India, Ireland, Scotland, and more. Back then, the British believed both Africa and the Americas to be primitive societies based on hunting and farming, and felt they needed to take over these nations in order to bring them up to speed with modern technologies. One of the most prominent examples of ethnocentrism was the Sinocentric system developed out of the idea of the "Mandate of Heaven" proliferated by the Chinese philosopher Confucius. According to the "Mandate of Heaven," the Chinese felt they received divine power that entitled them to exert heavy rule over the citizens, and that they had power over the rest of the world. In fact, the Emperor was referred to as the "Son of Heaven," exemplifying the intense control he had over the people. One of the most well-known and horrific examples of ethnocentrism pertains to Nazi Germany. Adolf Hitler decided he hated Jewish people, as well as other groups of people, and had many innocent people slaughtered in concentration camps. Obviously, they didn't deserve the torture they received, and this was clearly an extreme case of ethnocentrism. While prejudice certainly leads to problems, very rarely in history has ethnocentrism led to the mass slaughter of millions of innocent people at the scale witnessed in Nazi Germany. Certain movies and TV shows revolve around a certain culture. They either make light of the culture's idiosyncrasies or embrace the wonder of it all. Let's take a look at a few examples. In the movies, ethnocentrism isn't often presented as a serious problem. It serves more as an entertaining device. The father in My Big Fat Greek Wedding constantly states that he can trace any word back to Greek origins. Furthermore, the entire movie is centered around the thrills and issues of planning a Greek wedding. Ultimately, though, the movie has a happy ending, subtly suggesting that the positives outweigh the negatives. Another example of ethnocentrism covered with humor occurs in the comedy American Wedding. Upon learning that her grandson isn't marrying a Jewish girl, Jim's grandmother becomes inconsolable. Furthermore, Michelle's father makes the mistake of toasting to his soon-to-be in-laws with hopes that they'll sit many happy shivas together. He's painted as a fool for his statement, and the movie subtly indicates a Jewish ethnocentrism. If you have Amazon Prime, you've probably seen ads for The Marvelous Mrs. Maisel. It tells the story of a young Jewish girl living in New York City in the 1950s. She was raised by strict Jewish parents, went off to college, and then married a nice Jewish boy. A few years into their marriage, her husband left her for - Heaven forbid - a Gentile. We watch the family as they spend their Sabbaths in the temple and clamor to win the rabbi's affection so he'll visit their home on the Sabbath. Mrs. Maisel befriends a Catholic co-worker and mocks the name of her church - Our Lady of Perpetual Sorrow. The show is purely a comedy, but there's no doubt this Jewish family thinks their culture is far superior to any Gentile's way of living. In Zora Neale Hurston's Their Eyes Were Watching God, the main character, Janie Starks, is a light-skinned black woman. For this, the other black woman in her town are full of contempt for her. She seems to straddle the line between black and white at various points. This novel indicates that ethnocentrism is an extremely broad topic because even within one's own ethnicity, divisions will be found. The writing illustrates important components of ethnocentrism in history as well because, before the victory of the Civil Rights era, blacks would often try to "pass" for whites, and those who succeeded were often scorned by other blacks. The "us" that Shylock is referring to are the Jewish people. As seen by Shylock's speech, ethnocentrism is a powerful force that weakens human relations. Shylock's point is that, despite the cultural differences, we are all still human. There's no intrinsic difference between a Jew and a Christian, a black and a white, a Chinese citizen and a German citizen, and so forth. 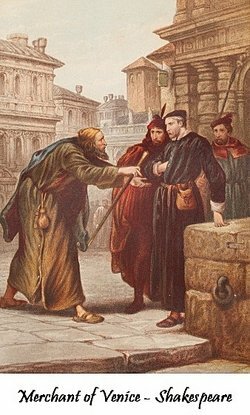 Although Shylock is painted as the villain of The Merchant of Venice, we can all take a lesson from him in order to avoid unfair prejudices that result from ethnocentrism. Perhaps, the next time you're assigned a persuasive essay in school, you'll consider tackling this important topic. Better yet, why not turn it into a persuasive speech? "Examples of Ethnocentrism ." YourDictionary, n.d. Web. 23 April 2019. <https://examples.yourdictionary.com/examples-of-ethnocentrism.html>. Ethnocentrism is a major factor in the divisions among members of different ethnicities, races, and religious groups. It’s the belief that one’s ethnic group is superior to another. Ethnocentric individuals believe they’re better than other individuals for reasons based solely on their heritage. Clearly, this practice relates to problems of both racism and prejudice.This comes in stark contrast to xenocentrism - the belief that someone else's culture is superior to their own. For example, you might meet an American who insists French culture is better than the American way of living.In truth, both ideals are a bit skewed. However, you’ll see in these examples of ethnocentrism that the practice is not only absurd, but potentially fatal.